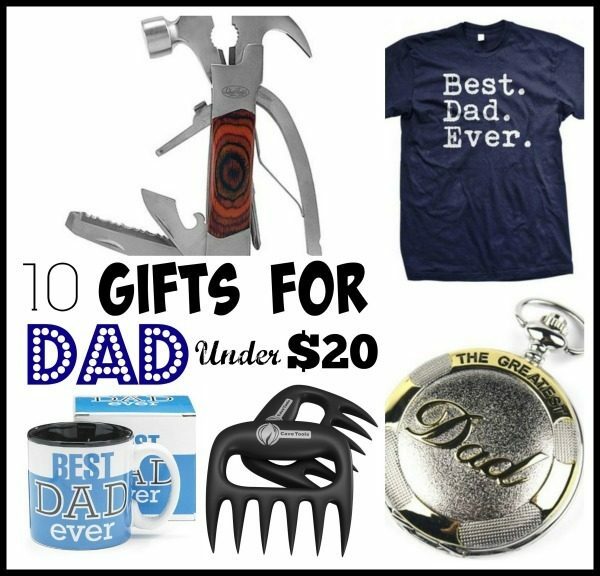 10 Gifts For Dad Under $20! You are here: Home / Great Deals / Amazon Deals / 10 Gifts For Dad Under $20! Having trouble coming up with some great gift ideas for the Dad in your life? Never fear – we’re coming to your rescue with this list of 10 Gifts for Dad under $20! Iron Man on DVD – $5 + FREE shipping with Amazon Prime or Super Saver Shipping! Just Me and My Dad – $3.99 + FREE shipping with Amazon Prime or Super Saver Shipping! 14-in-1 Hammer Tool – $7.35 + FREE shipping with Amazon Prime or Super Saver Shipping! Best Dad Ever Coffee Mug – $8.30 + FREE shipping with Amazon Prime or Super Saver Shipping! Best. Dad. Ever. Mens T-shirt – as low as $9 + FREE shipping! Why a Daughter Needs a Dad: 100 Reasons – $10.93 + FREE shipping with Amazon Prime or Super Saver Shipping! The Monuments Men on DVD – $11.96 + FREE shipping with Amazon Prime or Super Saver Shipping! World’s Greatest Dad Stainless Steel Pocket Watch – $12.99 + FREE shipping with Amazon Prime or Super Saver Shipping! Pulled Pork Shredder Claws – $13.99 + FREE shipping with Amazon Prime or Super Saver Shipping! CD Slot Mount Smartphone GPS Holder + FREE Foldable Card Size Portable Smartphone Stand – $14.99 + FREE shipping with Amazon Prime or Super Saver Shipping!